CREDIT: Barbara Kasten, 1982. Polacolor print. SBMA, Gift of Arthur and Yolanda Steinman. Courtesy of the artist. CREDIT: Harold Edgerton, 1938. Dye transfer print. SBMA, Gift of the Harold and Esther Edgerton Foundation. CREDIT: Michael Disfarmer, American, ca. 1930-1952. SBMA, Gift of Michael Yanover and Rhonda Milrad in memory of Philip Yanover. CREDIT: Bevan Davies, 1976. Gelatin silver print, ed. 6/20. SBMA, Gift of Martha Henderson. Brought to Light: Revelatory Photographs in the Santa Barbara Museum of Art Collection presents a non-traditional survey of the Museum’s renowned collection of nearly 8,000 photographs. Based not on chronology or theme, the exhibition seeks to reveal new insights into well-known artists’ work by featuring lesser known, even unusual, images, and recently acquired works by artists entirely new to the SBMA collection that have never before been seen in the Museum’s galleries. This extensive exhibition, one of the first of its kind at the SBMA, aims to deepen and expand our audience’s perception of the SBMA’s stellar photography holdings by uncovering, like never before, fresh and intriguing perspectives on its unique character and depth. 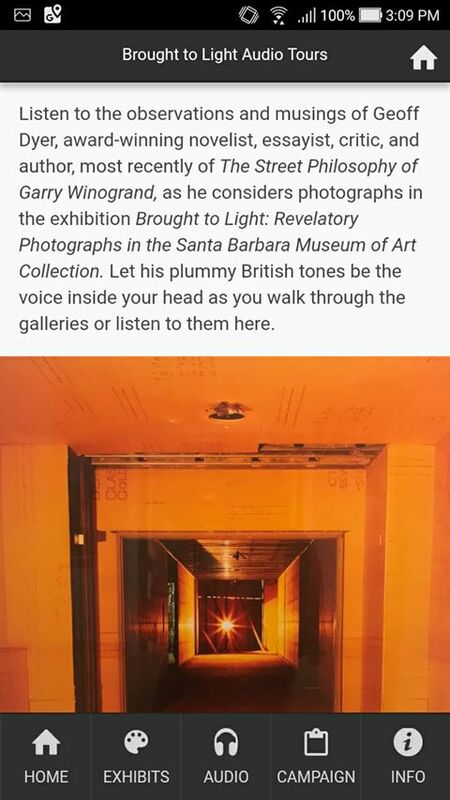 Brought to Light celebrates the art of photography at the Santa Barbara Museum of Art as it continues its exciting multi-stage renovation project that will include permanent photography galleries for the first time in the Museum’s history. Artists will include Berenice Abbott, Ansel Adams, Dawoud Bey, Manuel Alvarez Bravo, Bevan Davies, Michael Disfarmer, Harold Edgerton, Anthony Hernandez, Barbara Kasten, Yevgeny Khaldei, Inge Morath, Gordon Parks, and Masao Yamamoto.